NuMedica Methyl Folate HP is designed with the most active form of biologically active folate to support the cardiovascular system, nervous system, and homocysteine metabolism. This powerful methyl folate supplement provides therapeutic levels of activated folate; activation means that the body does not need to convert it for use in the body. Instead, it's ready to get to work and provide optimum support for essential systems of your body. How much of this supplement contains the biologically active L-methylfolate? 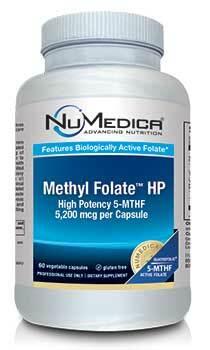 The full label claim is biologically active methyl folate (10,400 mcg / 2 capsules). To reach that claim, each serving actually has double that amount (20,800 mcg / 2 capsules) of Quatrefolic methyl folate which is a 50% elemental yield ingredient.